We all do complicated things effortlessly. If you can think back to when you were learning to drive a car, for example, it seemed incredibly difficult. You thought about how hard to push the pedals. You had to remember to turn on your blinker and to look in the mirrors. Coordinating your brain to hold the wheel steady while looking away from the view in front of you was a challenge. Yep, driving a car is pretty complicated and yet most of us who have been doing so for any period of time do it effortlessly. One must have a good balance between the perceived challenges of the task at hand and his or her own perceived skills. One must have confidence in one’s ability to complete the task at hand. This, of course, isn’t limited to athletics. In fact, it’s a pretty good roadmap for business success too. Clear goals, losing track of time due to your total focus on the moment, intense focus on the task you’re doing, and constant, real-time feedback that allows you to adjust your game plan all are places where good businesspeople live. I’ll add one caveat. 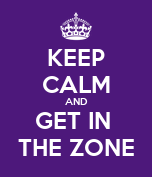 While getting to, and living in, “the zone” is a wonderful thing, we all need to venture out of that zone every so often. Maybe it’s more about distinguishing a comfort zone from a flow zone. I’m way less fond of the former than I am the latter. Have you ever been in that zone? Does this make sense?